When it comes to ice cream party time, and I have made thirty-plus flavors of ice cream, I am always scrounging for containers. At the same time, I have become quite an "expert" on what works best. My favorite is the 32-oz. 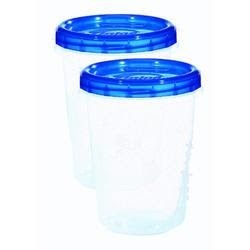 yogurt container. Being a screenprinter, I also use these to mix my inks, so I can never have too many yogurt containers. Mind you, I don't use them for ink then bring them back to use for ice cream -- you're either an ink container for the rest of your life, or an ice cream container. I've used Rubbermaid, Ziploc, and these great new containers from Ball that stack and store beautifully. One problem with the 4 cup (32-oz) containers is sometimes you either have too much ice cream for the container, or too little. If your problem is the former (poor you!) you have two choices: 1.) eat the overage 2.) stock up on a bunch of one and two cup containers and have a mini cup as well (good for storing in the back of the freezer for an ice cream emergency!). If your problem is the latter, just make sure you press plastic wrap against the ice cream before using the container cover, to keep additional air out of your ice cream -- otherwise your ice cream will get icy). On average though, I like the 4 cup size the best -- it usually fits the production perfectly -- most often with a little bit left that doesn't fit that is just enough to eat right out of the machine! One last note: while making ice cream at the cabin in Vermont, I could find no plastic containers anywhere. Uncle Charlie had a genius idea -- finish the last bits of ice cream left in the three Ben & Jerry's containers, wash them, and use that. In a pinch, this always works and there is the added bonus of having to "clean" the containers out first! The containers from Ball are great (I "borrowed" a few from my wife's collection). The screw top really seems to do a good job of keeping out the freezer burn. Dubba: I do love them, but I did learn if you fill them too full, the covers freeze to the ice cream! Ha! Also, sometimes I have a hard time getting it to catch when screwing it on...! TripleScoop: Great story! I would never look at you strange!